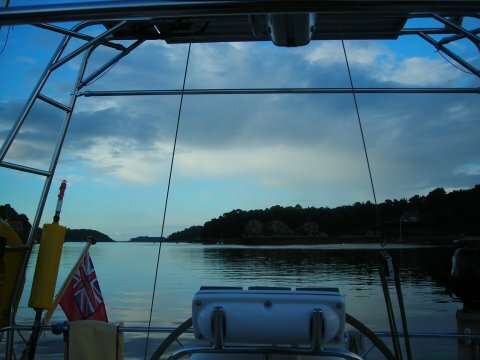 So we finally left St Quay last Sunday morning, after refuelling. An encouraging 10 knots of wind in the marina, nothing outside - merde! "Tudora" left about an hour after us, and we were able to get proof positive that our Active-X radar reflector does indeed work, greatly enhancing our target size. We also confirmed that "Tudora" had a problem with their VHF radio, later identified as a faulty aerial changeover switch. 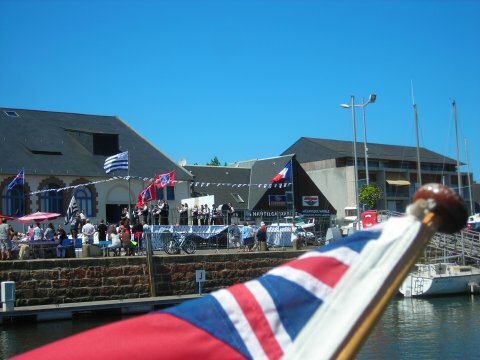 We had some interesting pilotage into Paimpol; for those of you who know it, imagine being locked in Sutton Harbour in Plymouth, and all the water receding to beyond the (outer) breakwater! However, as we arrived at high water, there was no problem, and the lock was on freeflow, so we drove straight in and parked, as we boating types say. From our berth we had a grandstand view of a fete celebrating the links between Paimpolese and Icelandic fishing fleets - we didn't really understand it, as much of it was played out in traditional dance, some of which involved tables and chairs, and it became no clearer after a bottle of wine, but it was entertaining. The music was good, including Breton and Scottish pipes. The view from our 'back door' at dusk in Lezardrieux. 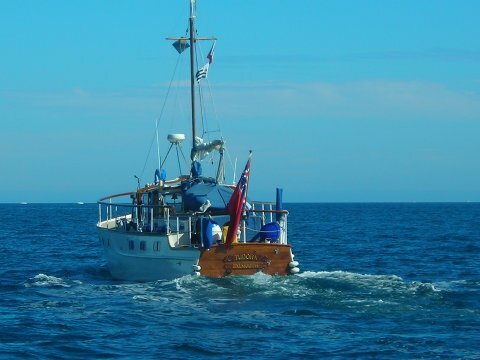 The graceful Tudora slipping past us en route from St Quay to Paimpol, after radar and radio tests. 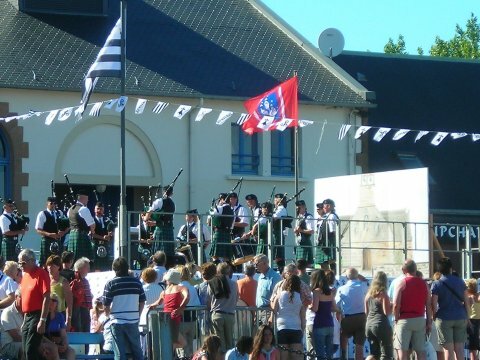 And a Breton Scottish (:-o) pipe and drum band....though Ann's CFO friends will be pleased to hear that they did play Callum's Road...or was it Lord Lovat's Lament...I can't remember which tune was which...sounded nice though! . 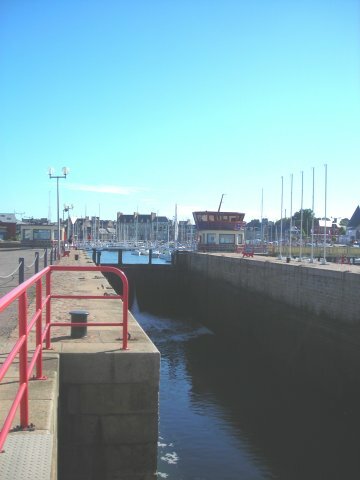 Paimpol lock - it was on freeflow when we arrived and departed. 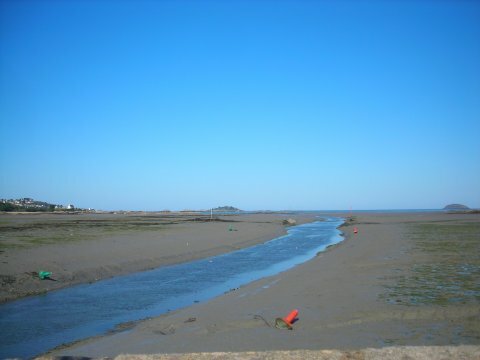 The entrance channel into Paimpol at low water. Will the water ever come back? 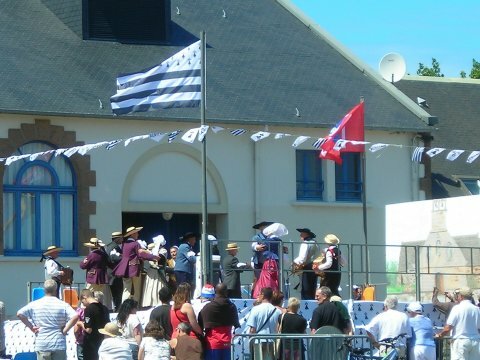 On Wednesday, after a few days in Paimpol, we moved on to Lezardrieux, on the Trieux River. The pilotage out of Paimpol was even more interesting, as we took the 'short' shortcut, as it was again high water when we left. Even at high water, the plethora of drying rocks gives an almost lunar seascape. The next morning, we had a surprise call from Martin & Judith, friends from Chipping Sodbury, who were travelling in the area, so they dropped by and brought heavy thunder showers with them, but it was nice to see them anyway! We had lunch in the first restaurant we came to, which wasn't bad, but not necessarily the best in town, but the decision to eat there was dictated by the next imminent downpour, which arrived about 10 seconds after stepping inside! 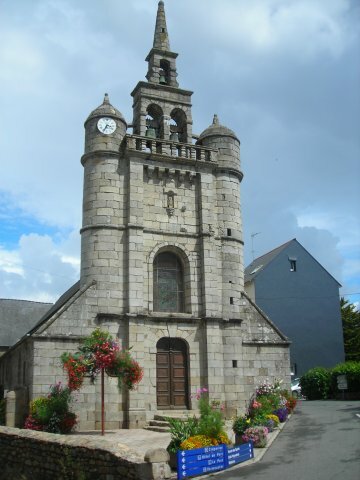 The church in Lezardrieux with its open belfry, built in the mid 18th century. 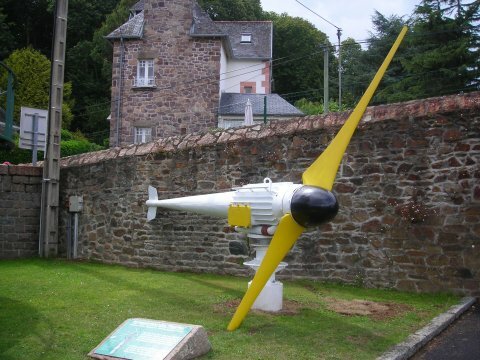 There are two very poignant war memorials in the church grounds, one to the young men of Lezardrieux who died for their country, and another to an RAF pilot named Meharry. 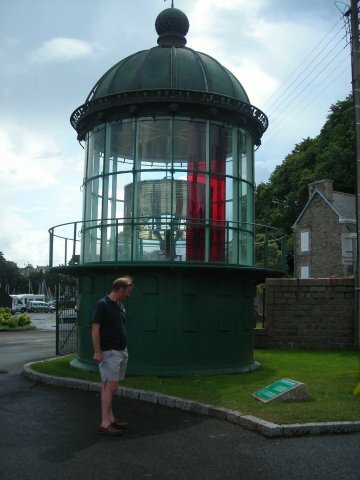 An old lighthouse preserved on the quay in Lezardrieux, originally powered, when it was in operation, by this wind generator. 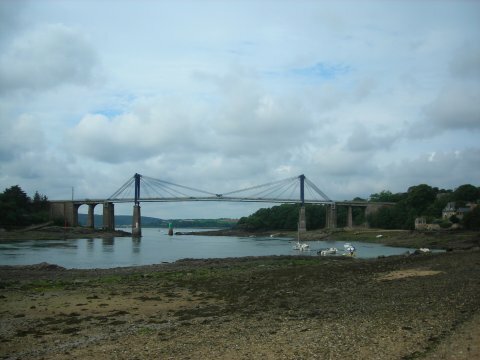 The next day was one of work & chores, but on Saturday we enjoyed a walk upstream under the suspension bridge and along the river bank for a few miles. 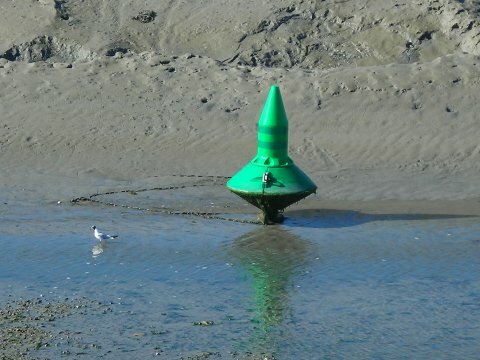 We've never seen so much samphire growing, but alas we had no fish to accompany it. The plan was to move on to Treguier this morning, but we awoke to thick fog and drizzle, and although we have all the nav aids on board, as this passage includes negotiating the most bumpy bits we've had to deal with so far and the pilot guide recommends the passage be undertaken only in good visibility, we decided not to go and to try again tomorrow. So, dear reader, you get this update earlier than intended, thanks to the vagaries of the weather.